Your near the end of CV4 now. I think you only have 2 stages left, 3 at most. Once you beat Death your basically done. Also, if you do play SOTN, try playing the PC Engine game first. 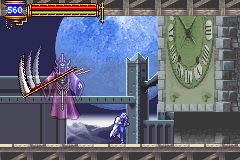 SOTN is a sequel to Dracula X, so much so that the "prequel" chapter of SOTN is a toned down version of the end of Dracula X. The Chandelier bit is my favourite bit in CV4 I think. The music, the dread (of falling) etc. just blended together really well on that bit. Lastly, the "II" icon basically means you can throw two items at once (two crosses etc.) Its real handy for bosses, in that you can decimate them even quicker that way! Yep, CVIV was right near the end. Completed it, though totally had to cheese Death, couldn't beat him normally. I was struggling badly on him so watched a video and saw a method where you stand next to the left platform and just hold the whip up. All of his strikes hit the whip and I was able to hit him with the special attack and occasional normal hit. I remembered this as being really dark and hard to see. Then I realised this was probably down to playing it on the original GBA. Booting it up on my GBA Micro and it looks brilliant. Save file reads 80.3%, which I thought was a little low. Had a mooch around and got stuck, I couldn't jump high enough to get out of the room. Had a mess in the options and I'd forgot about the ability to hold R to fire myself into the sun. After some map exploration I slowly unlock a few more tiny hidden areas and a great big block that looked to be filled in. Worked my way up there and memory was jogged back 10+ years. I was stuck on the penultimate boss. He again handed me my arse several times so I went back from him and tried to increase in level. I searched for any remaining cards I didn't have and ended up with just missing 4. Couple of levels later and a tactic in mind I tried him again and beat him with ease. All I had to do was stand next to him and jump his attacks. My rhythm wasn't as flawless at this spoiler execution but I was near close. I also cheesed it with hiding at times and healing with the card. Just a shame I didn't watch the video before my many futile attempts. Dracula was fairly easy. He had an interesting and new second form, after about three deaths I perfected the tactic and beat him without taking any damage. Game complete, 95% map uncovered and the desire to play some more. So what remains to do? I'm fairly certain I've uncovered all the map and the remaining 5% I need is the Battle Arena where the arrow in the map is. I really can't do that Arena though. I can get a few floors in but have sustained too much damage. It's an area where you can't use your magic cards, can't save inbetween and if you leave at one of the handful of exits then you restart from the beginning. You face significantly stronger versions of enemies, one after another. My main issue is that I don't have any potions to heal. You can't buy them and have to grind certain foes to make them drop the loot. I also need to grind normal enemies to get to a higher level and stronger. I don't really want to do either so I'm left at something of an impasse with no desire to spend hours killing the same foe for XP. Annoyingly the last four magic cards I need are in the arena too. So the game gets left alone, maybe I'll start a new save file and spend longer levelling up through normal play. File select screen also reveals a password for subsequent playthroughs. Well 200% complete is fairly conclusive. Looking at the save file I've also finished the boss modes that open up post completion. Thing is I don't remember a thing about the game. A replay will have to wait though. Edited by bowser123, 08 February 2015 - 07:30 PM. I really like the box art on this one. The excellent Castlevania logo stands out, I like it in the gradients from red to yellow. The main image has a whole light/ dark thing going on, which features heavily as a theme in the game. The picture doesn't really pick it out but on inspection in the shadows of the left black is a bat and demon, with specks of blood dotting to the top of the CV logo. Barely half done (probably only 1/4 if it pulls the SotN stunt) and not even 4 hours on the clock. I was so sure I'd played and finished this but I really wouldn't have deleted a completed save file. I'm saved just outside a boss room in Death, but my initial go of him suggests he won't be too hard as I gave him a good fight without really remembering the games system. So I started the game again on file 3. After 3 hours on the new file play I'm basically at the same point I left off on the other one, a level lower but a similar map size uncovered and saved outside Death. I really like this game. Everything is so slick and smooth, it's all so well animated and flows beautifully. I've played so many of this type of game that I can spot the next power up before it occurs but it's still been a kick as the protagonist gets powered up. Some of the stuff he has learned is already ridiculously powerful (walking on water seems particularly godly), and along with the way the story is going I have an inkling the hero isn't who he is supposed to be. The themes of the story so far have been the fight of a darker side taking over, of people not being who they first appear to be. In this he inherits the spirits of defeated foes and gains their powers. What I also like is the variety in the weapons that changes your play style. I was sporting a chain sword for some time (it's a whip basically) despite it being weaker than other weapons because I liked the range it had. However at times I changed to a shorter ranged sword that was expert at stabbing, getting multiple hits in quickly and with a flourish. This, combined with the shoulder button to backstep alters how I play. The excellent soul system further changes how you play. 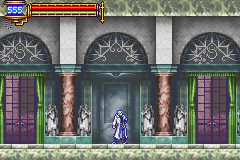 Another interesting touch was finding the painting in the castle that you see when you die and face game over. I'm not sure of it's significance or meaning yet, but it was nice picking it out amongst the castles decor. Difficulty wise it's been quite balanced, the occasional tricky boss and one hellish section that I barely survived through but largely it's doable without being a walkover. I have no idea why I didn't play more first time but it's certainly made a good impression now. 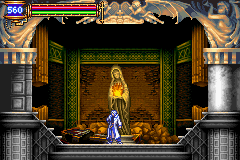 It helps that I'm right in the mood to play a Metroidvania but this is shaping up to be very good.